Whereas in theory members of the Roman Senate and their sons were restricted when engaging in trade, the members of the Equestrian order were involved in businesses, despite their upper class values that laid the emphasis on military pursuits and leisure activities. Plebeians and freedmen held shop or manned stalls at markets, while vast quantities of slaves did most of the hard work. The slaves were themselves also the subject of commercial transactions. Probably due to their high proportion in society (compared to that in Classical Greece), and the reality of runaways; as well as, the Servile Wars and minor uprisings, they gave a distinct flavor to Roman commerce. The negotiatores were in part bankers because they lent money on interest. They also bought and sold staples in bulk or did commerce in wholesale quantities of goods. The argentarii acted as agents in public or private auctions, kept deposits of money for individuals, cashed cheques (prescriptiones) and served as moneychangers. They kept strict books, or tabulae, which were considered as legal proof by the courts. In some instances the argentarii are considered as a subset of the negotiatores and in others as a group apart. The argentarii sometimes did the same kind of work as the mensarii, who were public bankers appointed by the state. The mercatores were usually plebeians or freedmen. They were present in all the open-air markets or covered shops, manning stalls or hawking goods by the side of the road. They were also present near Roman military camps during campaigns, where they sold food and clothing to the soldiers and paid cash for any booty coming from military activities. The Forum Cuppedinis in ancient Rome was a market which offered general goods. At least four other large markets specialized in specific goods such as cattle, wine, fish and herbs and vegetables, but the Roman Forum drew the bulk of the traffic. All new cities, like Timgad, were laid out according to an orthogonal grid plan which facilitated transportation and commerce. The cities were connected by good roads. Navigable rivers were extensively used and some canals were dug but neither leave such clear archaeology as roads and consequently they tend to be underestimated. Maintaining peace was a major factor in the expansion of trade. All settlements, especially the smaller ones, could be located in economically rational positions. Before and after the Roman Empire, hilltop defensive positions were preferred for small settlements and piracy made coastal settlement particularly hazardous for all but the largest cities. By the 1st century, the provinces of the Roman Empire were trading huge volumes of commodities to one another by sea routes. There was an increasing tendency for specialization, particularly in manufacturing, agriculture and mining. Some provinces specialized in producing certain types of goods, such as grain in Egypt and North Africa and wine and olive oil in Italy, Hispania, and Greece. Knowledge of the Roman economy is extremely patchy. The vast bulk of traded goods, being agricultural, normally leave no direct archaeology. Very exceptionally, as at Berenice, there is evidence of long distance trade in pepper, almonds, hazelnuts, stone pine cones, walnuts, coconuts, apricots and peaches besides the more expected figs, raisins and dates (Cappers). The wine, olive oil and garum (fermented fish sauce) trades were exceptional in leaving amphorae behind. There is a single reference of the Syrian export of kipi stiff quince jam or marmalade to Rome. Even before the republic, the Roman Kingdom was engaged in regular commerce using the river Tiber. Before the Punic Wars completely changed the nature of commerce in the Mediterranean, the Roman republic had important commercial exchanges with Carthage. It entered into several commercial and political agreements with its rival city in addition to engaging in simple retail trading. The Roman Empire traded with the Chinese (via Parthian and other intermediaries) over the Silk Road. Maritime archeology and ancient manuscripts from classical antiquity show evidence of vast Roman commercial fleets. The most substantial remains from this commerce are the infrastructure remains of harbors, moles, warehouses and lighthouses at ports such as Civitavecchia, Ostia, Portus, Leptis Magna and Caesarea Maritima. At Rome itself, Monte Testaccio is a tribute to the scale of this commerce. As with most Roman technology, the Roman seagoing commercial ships had no significant advances over Greek ships of the previous centuries, though the lead sheeting of hulls for protection seems to have been more common. The Romans used round hulled sailing ships. Continuous Mediterranean "police" protection over several centuries was one of the main factors of success of Roman commerce, given that Roman roads were designed more for feet or hooves than for wheels, and could not support the economical transport of goods over long distances. The Roman ships used would have been easy prey for pirates had it not been for the fleets of Liburna galleys and triremes of the Roman navy. The trade over the Indian Ocean blossomed in the 1st and 2nd century AD. The sailors made use of the monsoon to cross the ocean from the ports of Berenice, Leukos Limen and Myos Hormos on the Red Sea coast of Roman Egypt to the ports of Muziris and Nelkynda in the Malabar Coast. The main trading partners in southern India were the Tamil dynasties of the Pandyas, Cholas and Cheras. Many Roman artifacts have been found in India; for example, at the archaeological site of Arikamedu, in Puducherry. Meticulous descriptions of the ports and items of trade around the Indian Ocean can be found in the Greek work Periplus of the Erythraean Sea (see article on Indo-Roman trade). A standard amphora, the amphora capitolina, was kept in the temple of Jupiter on the Capitoline Hill in Rome, so that others could be compared to it. The Roman system of measurement was built on the Greek system with Egyptian influences. Much of it was based on weight. The Roman units were accurate and well documented. Distances were measured, and systematically inscribed on stone by agents of the government. Alexander the Great had conquered as far as India, and the Roman god Bacchus was also said to have journeyed there. The Far East, like sub-Saharan Africa, was a mysterious land to the Romans. 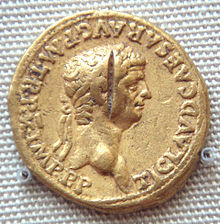 Gold coin of Claudius (50-51 CE) excavated in South India. There was an Indian in Augustus's retinue (Plut. Alex. 69.9), and he received embassies from India (Res Gestae, 31); one which met him in Spain in 25 BC, and one at Samos in 20 BC. The trade over the Indian Ocean blossomed in the 1st and 2nd century AD. The sailors made use of the monsoon to cross the ocean from the ports of Berenice, Leulos Limen and Myos Hormos on the Red Sea coast of Roman Egypt to the ports of Muziris and Nelkynda in Malabar coast and. The main trading partners in southern India were the Tamil dynasties of the Pandyas, Cholas and Cheras. Meticulous descriptions of the ports and items of trade around the Indian Ocean can be found in the Greek Periplus of the Erythraean Sea. In Latin texts, the term Indians (Indi) designated all Asians, Indian and beyond. The main articles imported from India were spices such as pepper, cardamom, cloves, cinnamon, sandal wood and gems such as pearls, rubies, diamonds, emeralds and ivory. In exchange the Romans traded silver and gold. 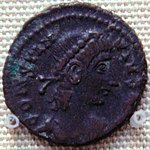 Hoards of Roman coins have been found in southern India during the history of Roman-India trade. Roman objects have been found in India in the seaside port city of Arikamedu, which was one of the trade centers. Green Roman glass cup unearthed from an Eastern Han Dynasty (25-220 AD) tomb, Guangxi, China; the first Roman glassware discovered in China, dated early 1st century BC, was excavated from a Western Han tomb in the southern port city of Guangzhou, most likely arriving via the Indian Ocean and South China Sea. There is suggestive archaeological evidence that Roman traders were present in Southeast Asia, which was roughly mapped out by Ptolemy in his Geography where he labelled the land bordering the Magnus Sinus (i.e. the Gulf of Thailand and South China Sea) as the Sinae. Their port city of "Cattigara", lying beyond the Golden Chersonese (Malay Peninsula) where a Greek sailor named Alexander allegedly visited, was quite possibly the ancient settlement at Oc Eo, Vietnam, where Roman artefacts from the Antonine period such as medallions from the reigns of Antoninus Pius (r. 138-161) and Marcus Aurelius (r. 161-180) have been found. An event recorded in the Chinese Weilue and Book of Later Han for the year 166 seems directly connected to this activity, since these texts claim that an embassy from "Daqin" (i.e. the Roman Empire) sent by their ruler "An Dun" (Chinese: 安敦; i.e. either Antoninus Pius or Marcus Aurelius Antoninus) landed in the southern province of Jiaozhi (i.e. northern Vietnam) and presented tributary gifts to the Chinese ruler Emperor Huan of Han. Rafe de Crespigny and Warwick Ball contend that these were most likely Roman merchants, not official diplomats sent by Marcus Aurelius (given the absence of this event in Roman sources). Despite two other Roman embassies recorded in Chinese sources for the 3rd century and several more by the later Byzantine Empire (Chinese: 拂菻; Pinyin: Fú lǐn), only sixteen Roman coins from the reigns of Tiberius (r. 14-37 AD) to Aurelian (r. 270-275 AD) have been found in China at Xi'an that predate the greater amount of Eastern Roman (i.e. Byzantine) coins from the 4th century onwards. Yet this is also dwarfed by the amount of Roman coins found in India, which would suggest that this was the region where the Romans purchased most of their Chinese silk. For that matter, the spice trade remained more important to the Roman economy than the silk one. From the 3rd century a Chinese text, the Weilüe, describes the products of the Roman Empire and the routes to it. While Livy makes reference to the Lex Claudia (218BC) restricting senators and sons of senators from owning a ship with greater than 300 amphorae capacity (about seven tons), they were still undoubtedly partaking in trade as Cicero mentions this law when attacking Verres, although he makes no move to charge him. Senators were still allowed to own and make use of ships under the size restriction, Cato when advising where to build a farm specifically mentions to have it built near an accessible river, road or port to allow transport of goods which is in direct conflict to Livy’s assertion that all profit made through trade by a senator was dishonorable. Senators often utilized free and enslaved agents as a loophole to legal restrictions, thereby allowing themselves to diversify their sources of income. That is not to say that the acquisition of wealth was not to be desired, Pliny notes that a Roman man should by honorable means acquire a large fortune and Polybius draws a comparison between the attitudes of Carthage and Rome towards profit from trade. Thus starts the confusion in the role of the elite in trade as Terrence writes that there is nothing wrong with large scale trade, it is in fact completely honorable and legitimate to import large quantities of product from around the world especially if it happens to lead to a successful trader buying land and investing in Roman agriculture; what is dishonorable is trade on a small scale. Small trade is again shown as vulgar by Tacitus as he describes the involvement of Sempronius Gracchus in petty trade. Cato himself was involved with trade, although he himself cautioned against it as it was a risky occupation, perhaps this was part of the reasoning to keep senators excluded from the trade business, as if they had a severe misfortune with trading they could fall below the financial threshold of being a senator, whereas comparatively land owning was a far safer investment. Plutarch describes Cato’s involvement in trade in great detail, depicting how he would use a proxy (a freedman by the name of Quintio) to run his business through a group of fifty other men. The restriction on senators trading was itself passed initially through the tribune of the plebeians, a class of people who the restrictions would not apply to. It is suspected that this reform could have been the equites and other wealthy merchants trying to muscle the senators out from the rapidly expanding trade business. The majority of the people of the Roman Empire were living in poverty, with an insignificant part of the population engaged in commerce being much poorer than the elite. The industrial output was minimal, due to the fact that the poor majority could not pay for the products. Technological advance was severely hampered by this fact. Urbanization in the western part of the empire was also minimal due to the poverty of the region. Slaves accounting for most of the means of industrial output, rather than technology. ^ An, Jiayao. (2002), "When Glass Was Treasured in China," in Annette L. Juliano and Judith A. Lerner (eds), Silk Road Studies VII: Nomads, Traders, and Holy Men Along China's Silk Road, 79–94, Turnhout: Brepols Publishers, ISBN 2503521789, pp 83-84. ^ Safrai, Ze'ev (1994). The Economy of Roman Palestine. London: Routledge. p. 78. ISBN 0203204867. ^ Grant, Mark (2000). Galen on Food and Diet. London: Routledge. p. 129. ISBN 0415232325. ^ Cappers, R. T. J. (2006). Foodprints at Berenike: Archaeobotanical evidence of subsistence and trade in the Eastern desert of Egypt. Monograph. 55. Los Angeles: Cotsen Institute of Archaeology UCLA. ISBN 1931745269. ^ "Radio 4 - Unearthing Mysteries". BBC. Retrieved 2012-11-07. ^ "South Asia | Search for India's ancient city". BBC News. 2006-06-11. Retrieved 2012-11-07. ^ Haywood, John (2000). Historical atlas of the classical world, 500 BC–AD 600. Barnes & Noble Books. p. 46. ISBN 0-7607-1973-X. Arikamedu was a trading port in the 1st century AD: many Roman artifacts have been excavated there. ^ Book III, Chapter 5 Archived 2006-07-28 at the Wayback Machine, copied by Pliny the Elder. ^ Harper, P.O. 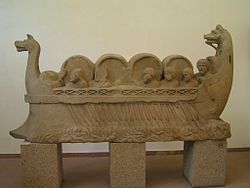 (2002), "Iranian Luxury Vessels in China From the Late First Millennium B.C.E. to the Second Half of the First Millennium C.E.," in Annette L. Juliano and Judith A. Lerner (eds), Silk Road Studies VII: Nomads, Traders, and Holy Men Along China's Silk Road, 95–113, Turnhout: Brepols Publishers, ISBN 2503521789, pp 106-107. ^ An, Jiayao. (2002), "When Glass Was Treasured in China," in Annette L. Juliano and Judith A. Lerner (eds), Silk Road Studies VII: Nomads, Traders, and Holy Men Along China's Silk Road, 79–94, Turnhout: Brepols Publishers, ISBN 2503521789, p. 83. ^ Raoul McLaughlin (2010), Rome and the Distant East: Trade Routes to the Ancient Lands of Arabia, India, and China, London & New York: Continuum, ISBN 9781847252357, pp 58-59. ^ Gary K. Young (2001), Rome's Eastern Trade: International Commerce and Imperial Policy, 31 BC - AD 305, London & New York: Routledge, ISBN 0-415-24219-3, p. 29. ^ a b Friedrich Hirth (2000) . Jerome S. Arkenberg (ed.). "East Asian History Sourcebook: Chinese Accounts of Rome, Byzantium and the Middle East, c. 91 B.C.E. - 1643 C.E." Fordham.edu. Fordham University. Retrieved 2016-09-19. ^ a b Warwick Ball (2016), Rome in the East: Transformation of an Empire, 2nd edition, London & New York: Routledge, ISBN 978-0-415-72078-6, p. 152. ^ a b Warwick Ball (2016), Rome in the East: Transformation of an Empire, 2nd edition, London & New York: Routledge, ISBN 978-0-415-72078-6, p. 154. ^ The following source, although printed in 2012, is outdated compared to Ball (2016: 154) in regards to the Principate-era coins found at Xi'an: Valerie Hansen (2012), The Silk Road: A New History, Oxford: Oxford University Press, pp 97-98, ISBN 978-0-19-993921-3. ^ Warwick Ball (2016), Rome in the East: Transformation of an Empire, 2nd edition, London & New York: Routledge, ISBN 978-0-415-72078-6, pp 154, 156. ^ "Weilue: The Peoples of the West". Depts.washington.edu. 2004-05-23. Retrieved 2012-11-07. ^ Haywood, John (2000). Historical atlas of the classical world, 500 BC–AD 600. Barnes & Noble Books. p. 27. ISBN 0-7607-1973-X. the empire's commercial classes remained small and enjoyed neither wealth nor the status of the landowning aristocracy...most production in the empire was small scale and under-capitalized, the rich preferring to invest in land. It is in any case doubtful, in view of the poverty of most of the empire's population, whether the markets existed to support a greater degree of industrial production. This is probably one of the factors behind the surprising lack of technological innovation in the empire...The ready availability of cheap slave labor may also have deterred investment in expensive machinery....But most of the west was too poor and under-populated to support this level of urbanization and towns remained primarily administrative or military centers. Bowman, Alan K., and Andrew Wilson. Quantifying the Roman Economy: Methods and Problems. Oxford: Oxford University Press, 2009. Callataÿ, François de. Quantifying the Greco-Roman Economy and Beyond. Bari: Edipuglia, 2014. Duncan-Jones, Richard. Structure and Scale In the Roman Economy. Cambridge: Cambridge University Press, 1990. Garnsey, Peter, and Richard P. Saller. The Roman Empire: Economy, Society and Culture. 2nd edition. Oakland, CA: University of California Press, 2015. Greene, Kevin. The Archaeology of the Roman Economy. Berkeley: University of California Press, 1986. Jones, A. H. M. The Roman Economy: Studies In Ancient Economic and Administrative History. Oxford: Blackwell, 1974. Lewit, Tamara. Agricultural Production In the Roman Economy, A.D. 200-400. Oxford: Tempus Reparatum, 1991. Peacock, D. P. S., and D. F. Williams. Amphorae and the Roman Economy: An Introductory Guide. London: Longman, 1986. Russell, Ben. The Economics of the Roman Stone Trade. 1st edition. New York: Oxford University Press, 2013. Scheidel, Walter. The Cambridge Companion to the Roman Economy. Cambridge: Cambridge University Press, 2012. Scheidel, Walter, Richard P. Saller, and Ian Morris. The Cambridge Economic History of the Greco-Roman World. Cambridge: Cambridge University Press, 2007. Temin, Peter. The Roman Market Economy. Princeton: Princeton University Press, 2013. Tomber, R. Indo-Roman Trade: From Pots to Pepper. London: Duckworth, 2008. Vrba, Eric Michael. Ancient German Identity In the Shadow of the Roman Empire: The Impact of Roman Trade and Contact Along the Middle Danube Frontier, 10 BC - AD 166. Oxford: Archaeopress, 2008.